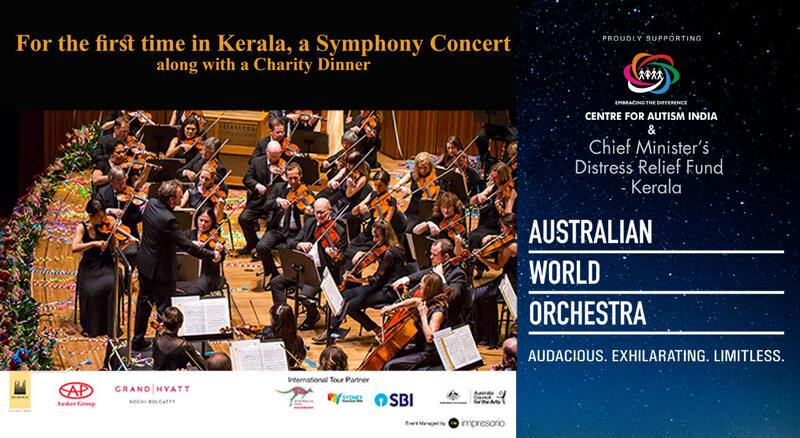 ‘Centre for Autism India’ is bringing the world renowned ‘Australian World Orchestra’ to raise funds for its development activities. The event will also support the ‘Chief Minister’s Distress Relief Fund’ that will provide assistance to those affected by the recent floods in Kerala. The symphony concert will be led by Artistic Director and Chief Conductor Maestro Alexander Briger AO. A special highlight of the concert will be a solo performance from the outstanding violinist Daniel Dodds on his 1717 Stradivarius violin. Mezzo-soprano Caroline Meng will be guest soloist and will perform 3 famous arias from Bizet’s opera, Carmen. This program will be performed by 52 of Australia’s finest musicians from the world’s leading orchestras including the Vienna and Hong Kong Philharmonic Orchestras, the Antwerp and London Symphony Orchestras, and musicians from the Australian state orchestras.